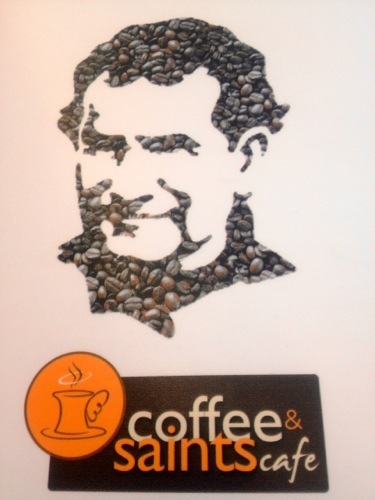 Coffee & Saints is a coffee shop run by the Don Bosco PUGAD, a project for migrant youth from all over the country. 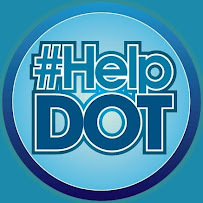 Other projects include bread making and water filtering stations where young men aged 17-21 gain technical skills and self-worth. 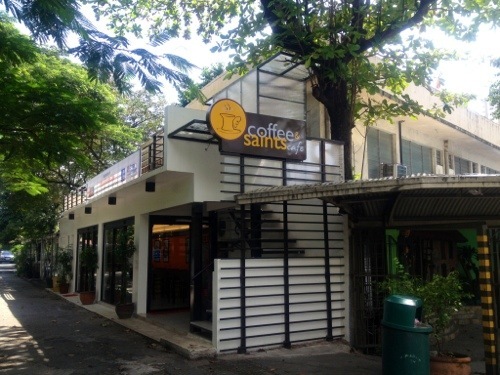 You’d find the coffee shop right beside the Don Bosco Church and within the church compound and parking lot. In my earlier blog, I wrote about a few of its simple menu offerings. 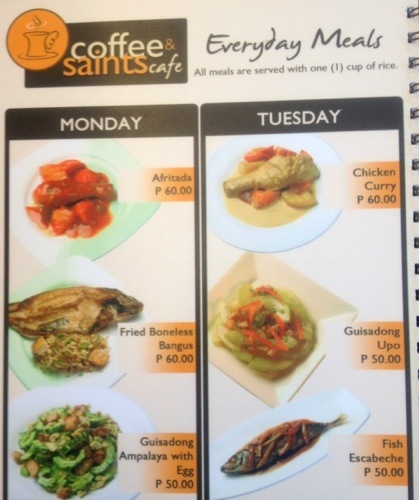 Today, the tiny coffee shop now offers home-cooked meals at very affordable prices. Check out these daily offerings through the photos below. Remember how we used to troop to Amicí just outside the church compound after hearing mass? At the time, it was just a simple “carinderia” with great pasta offerings and many gelato flavors. 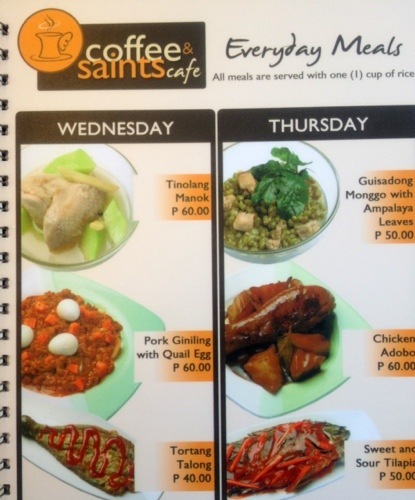 Well, Coffee & Saints is no trattoria and no, they only offer Pinoy everyday meals. But from the “Silog” series come these comfort food at prices well within one’s budget. Who says you can’t enjoy home-cooked comfort food while staying frugal? Plus the tiny dining place is tidy, packed with ambience, and manned by eager to please migrant youth. 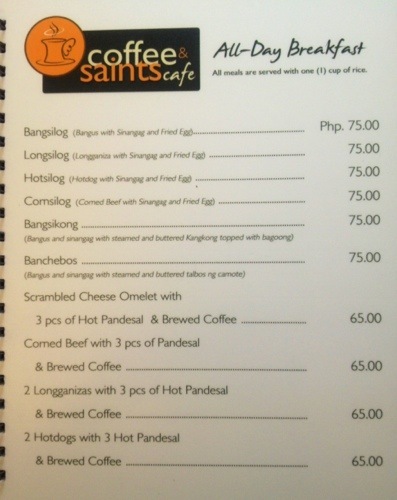 And if you’re still stuck with Coffee & Saints’ original “Silog series”, they’re still available. EVERYDAY. 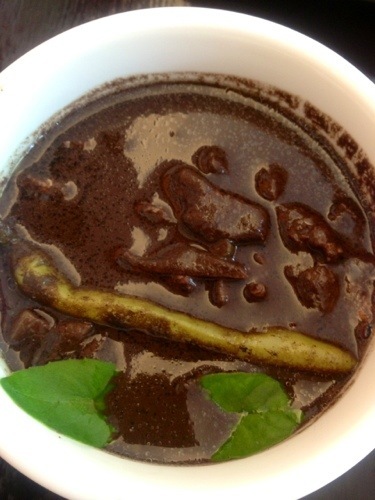 Same with their desserts, except that some of the “Kakanin” are available only at certain hours of the day. Me? 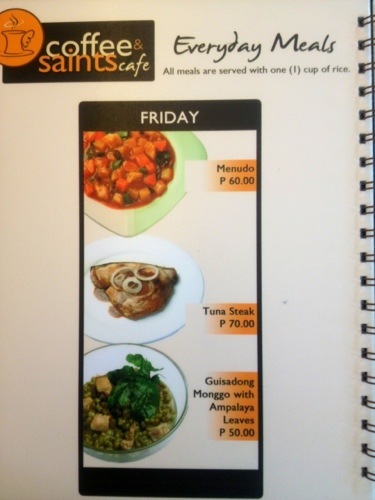 I promise to try a new dish every visit along with my “standard daing na bangus”. 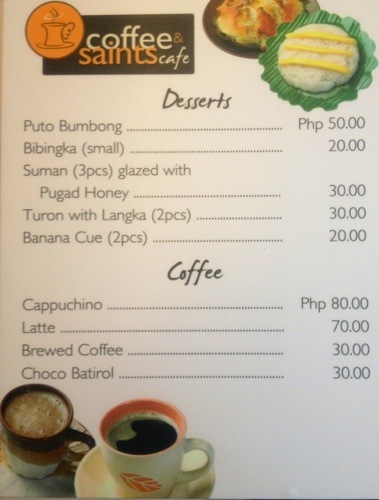 And if you don’t care for their desserts, ask for the Pugad cookies priced at P20 each. There are cookies flavored with malunggay or ashitaba leaves. The same leaves you’d find in your ginisang mongo and dinuguan dishes. 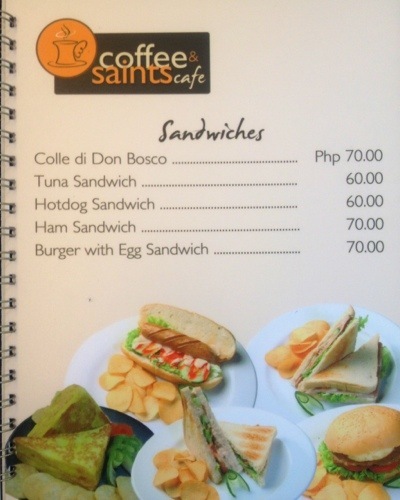 And oh, don’t forget to try their Barako coffee or the chocolate batirol. 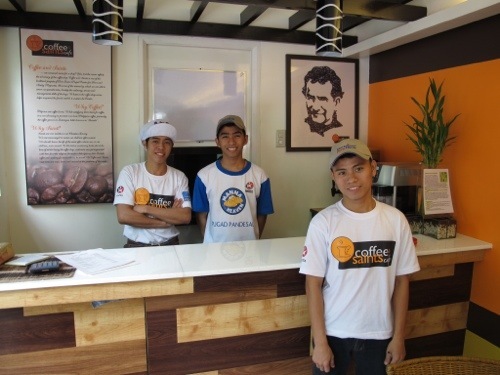 The Pugad boys will cheerfully serve them while you’re waiting for your orders. Bless these boys. God bless you too for patronizing this place! Oh, please do. Meet the Pugad boys and enjoy the budget meals there.